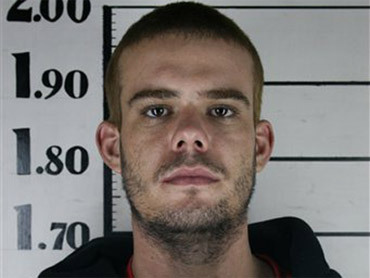 Joran van der Sloot is afraid he'll be killed behind bars, one of his attorneys says. This, as new details surface about the confession Peruvian police say they got from him in the slaying of Stephany Flores, a 21-year-old business student. The 22-year-old Dutchman is being held in a Lima prison cell with a contract killer, and told the lawyer he fears for his life, reports CBS News Correspondent Jeff Glor. He's charged with murdering Flores in his hotel room May 30 after they met playing poker in a casino. He's also long been the chief suspect in the 2005 disappearance of Alabama teen Natalee Holloway in Aruba. When van der Sloot was arrested, he told Chilean police he and Flores had been victimized by bandits. Van der Sloot has been known to tell multiple stories to police and the press over the years. And his assertions to Chilean authorities are wildly at odds with what Peruvian investigators say really happened. When van der Sloot was nabbed in Chile June 3, police there say, he told them that, the day before Flores died, two bandits had pulled them over on the road and robbed her of $4,000. He then said those same men came to his Lima hotel room the next day, and that Flores raised her voice to them, causing one man to hit her, possibly breaking her nose. Former federal prosecutor Laurie Levenson told CBS News that story won't wash. "He was with her before she died," Levenson says. "He was the last person with her. He's gotta come up with someone else if they're going to think it wasn't him who was the killer." Peruvian police have accused van der Sloot of brutally murdering Flores -- saying he "acted with ferocity and great cruelty." Copies obtained by the media show that in his confession, van der Sloot said the two were playing online poker on his laptop when an e-mail arrived mentioning the Holloway case. A surprised Flores then allegedly punched van der Sloot in the head. In response, he said, he broke her nose, strangled her for a full-minute, then suffocated her with his shirt. Van der Sloot's Peruvian attorney, Maximo Altez, wants the confession tossed out, on the grounds it was made with a defense lawyer appointed by police there. Van der Sloot's mother, a recently widowed school teacher, is expected to arrive in Peru in the next few days, accompanied by the family's own "media adviser."